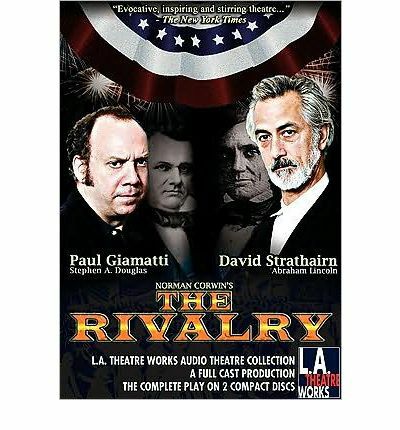 Released in conjunction with the 200th anniversary of Lincoln's birthday, The Rivalry recreates the fiery face-off between the rising Illinois legislator Abraham Lincoln and incumbent Senator Stephen A. Douglas. The play features Academy Awards nominees Paul Giamatti in the role of Stephen A. Douglas and David Straithairn as Abraham Lincoln. Two Presidential candidates - one a rising Illinois legislator, the other a bombastic US Senator. Obama and McCain? Think again. In this transcendent Broadway play, the famous Lincoln-Douglas debates tackle the day's most passionate issue - slavery. Their battle comes to life through the eyes of Adele Douglas, wife of candidate Stephen Douglas. Challenged by the charming man from Illinois, she reexamines her basic beliefs about the American concept of freedom. "Evocative, inspiring and stirring theatre]]" raves The New York Times.